Natural disasters, leaking appliances, and burst pipes are some of the common causes of water damage. This type of damage is nothing to play around with, especially if it has affected your carpeting. Certain parts of a carpet feature extremely absorbent materials. If you do not dry them in time and mold starts to grow, it can become very difficult to save the carpet. In these cases, it is recommended that you consult with a professional. 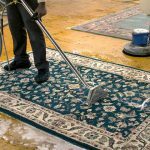 At Reilly’s Oriental Rug Cleaning, we specialize in water damage restoration services for water damaged carpets. When floods or plumbing issues occur in one’s property, the carpet itself does not retain the water. They top layers do not offer much resistance to water that passes through its fibers. Certain parts such as the padding or cushion underneath the carpet hold on to the water once they get wet. If these problems are neglected, mold, mildew, and bacteria will start to grow. Depending on the amount of water that leaked from an appliance or was released from a burst pipe, the liquid may spread to the edges of the room in a few minutes or hours. One may touch his or her carpet at the corner of the room, however, it may not have a feeling of dampness. In many cases, the carpet’s pad is already saturated. It is important for homeowners to act quickly, i.e., dry the carpet or contact a water damage restoration specialist. If not, the carpet can shrink, ripple, lose its color, and more. What are the Benefits of Water Damage Restoration Services? One of the biggest benefits of water damage restoration services is their ability to prevent mold growth. A mold may start growing within the first 48 hours of flooding. Even after removing standing water, mold will continue growing on surfaces that are still wet or damp. The problem with mold growth is that it’s difficult to spot as they can occur within flooring materials, especially under carpets. By using professional water damage restoration services, one can remove said contamination before it develops into a more severe problem. Our team initiates the water damage restoration process by identifying the source of the leak or flood. After that, we will decide if your carpet is salvageable or not. If we are dealing with contaminated black water, e.g., groundwater and raw sewage, we will have no choice but to discard the affected carpet(s). Our team will then attempt to stop the water flow to prevent any further damage. The next few steps will involve Reilly’s Oriental Rug Cleaning disinfecting the wet area, ventilating the room, removing wet carpet padding, elevating the carpet, setting up industrial-grade fans for quick drying purposes, and more. If we are tackling more severe water damaged carpets, we will facilitate the drying process in our own facility. At Reilly’s Oriental Rug Cleaning, our water restoration services are available both day and night. We employ special techniques to restore water damaged carpets to their original state. Our family-owned business was founded in 1918 and we have over 100 years of experience in carpet care. You can enjoy complete peace of mind that we will get the job done in the most efficient and cost-effective way possible. Are you interested in using Reilly’s Rug and Carpet Cleaning’s water damage restoration services? Do not hesitate to call 201-445-0800 or email us at Info@RugClean.net for more inquiries.